Battlestar Galactica, BSG, Starbuck and Apollo, Syfy Colonel Tigh | girlpocalypse. Need someone with some sewing skills, asap. If you haven’t watched it yet and you are a fan of sci-fi/fantasy drama, then stop reading and watch. I offer nothing but spoilers from here on out. And, despite my incessant need to read anything and everything written about a show, I managed to do it (mostly) without spoilers — Totally worth it, because it offers some pretty game-changing surprises that are worth the excruciating wait. From start to finish, the show does not disappoint – and the thing about watching something non-stop instead of broken up over weeks and seasons and years, is you are flooded with information. By the series finale my mind was constantly running, and I was babbling nonsensically like a cylon hybrid in a bathtub full of petroleum jelly. To make some sense of my gushing praise of the show, I’ve narrowed it down to 10 things that set BSG apart for me. There are more, but I am sure you have better things to do this week. Like start watching (or re-watching) for yourself. 9. Ellen is the fifth Cylon! $%@&! Take your piety and your moralizing and your high-minded principles, and stick ’em some place safe… I’ve got a war to fight. From very early in the first season I called it: Colonel Tigh would be my favorite character — not only on BSG, but in the history of TV. I stepped onto this soap box tentatively, because I was unsure whether he would do something completely off the wall and I would have to backtrack slowly away from the statement. After all, I was warned the show takes some pretty drastic unconventional turns. But I wanted it out there in the universe, just in case I was right. And I was right. 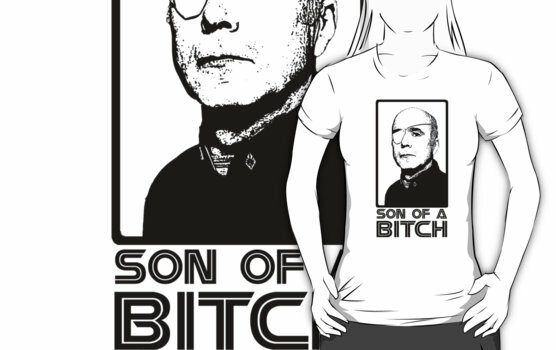 Colonel Saul Tigh is an epic, amazing character that shall go down in history as one of the best characters on television. 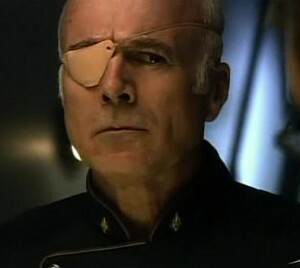 I am such a fan of his that someday I will adopt a one-eyed rescue animal and name him Colonel Tigh. (If you steal this idea, I better not run into you at the dog park.) And, let’s face it, even if he has two eyes, I’ll probably still name my next pet that. From day one, Tigh had that surly anti-hero quality I find appealing on television. Sure, he starts the show as a gruff, heavy-drinking old timey antagonist butting heads with Starbuck’s newfangled ways, but you know there is a story there, and how it is told will make or break a character. Kudos to the writers and to Michael Hogan for creating a compelling, complex and perfectly executed character from start to finish. 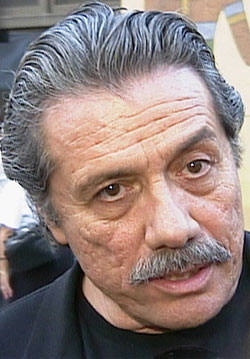 Way to show him up with your perfectly groomed facial hair, Adama. A set-in-his-ways officer from the old school with a drinking problem and a serious distaste for those who question authority, who has complicated relationships with his equally flawed wife, Ellen, and oldest comrade, Adama, with whom he perfectly encapsulates the unconditional love and respect of lifelong friends. With the insurgency, he takes on another role – a leadership role, which he struggled with on Galactica. As he leads this resistance, he does questionable things, but he is a man that lives by a code. To stay true to this code, he kills his own wife as he would have done anyone else guilty of her crimes. While on one hand, this exposes the nature of the insurgency, it also exposes Tigh’s character. He is not one to make an exception — not for Ellen and not for himself. One of my favorite scenes comes as Adama leads the rescue mission and Tigh returns to Galactica bushy bearded and eyeless. As Adama is hoisted up amid cheers, Tigh stands off to the side and your heart breaks a little for him. Should they be cheering his name? Not even he would want that – after all, he did terrible things – but, those terrible things also helped the greater good, those terrible things needed to be done. Where he failed in a structured leadership role on the ship when Adama was incapacitated, he arguably succeeded as a leader in the insurgency — illustrating the perfection of the Adama/Tigh relationship. I just wanted to give him a hug. My name is Saul Tigh. I’m an officer in the Colonial Fleet. Whatever else I am, whatever else it means, that’s the man I want to be. And if I die today, that’s the man I’ll be. For a character, who in flashbacks we see in a drunken pool of self-pity reluctantly returning to duty aboard Galactica, who we consistently see struggling throughout the show with his place in the fleet, for this character to come to terms in this moment with who he is, and choose it so certainly, when everything down to his genetic make-up is saying the opposite, is a powerful moment. And the depths of his characterization just do. not. stop. His relationship with Caprica Six and the loss of his unborn child is just another in a long list of examples of Tigh’s versatility and limitlessness as a character. “I don’t need to say it. I shouldn’t need to say it to anyone. Isn’t it enough that I feel it?” I can’t. I honesty can’t write more about this for fear that I will lose my motivation to write and end up in the fetal position. 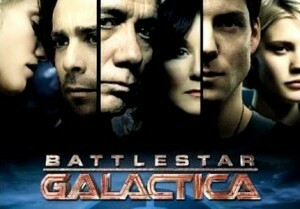 What makes BSG so compelling for me is not space (which is awesome), but the characters. It’s funny that the thing that makes this incredibly unique show so unique is its characters – which despite many being machines, are still very human creatures. 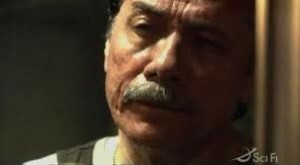 It often appears that the moral center of the show is Admiral Adama, but even he has made mistakes – imperfect decisions as an officer and as a husband and father. And even the most morally corrupt at the start of the show, which I would argue is Caprica Six, who in the pilot brings about the mass genocide of an entire planet shortly after murdering a baby with her bare hands, is capable of redemption. We start out with the most clear-cut example of good vs. evil that could possibly be, but as you travel this journey, it becomes pretty clear that nobody is perfect, everyone is flawed, and everything is more complicated than it seems on the surface. The idea of good vs. evil is rendered completely irrelevant by mid-series. 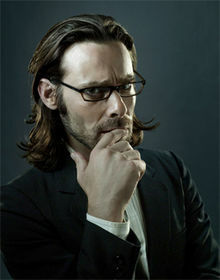 This is made especially apparent with Gaius Baltar. Baltar is neither good nor evil. If there is a spectrum of morality, Baltar is not even on it. He’s about a mile down the road, wondering how he got there and who’s to blame as he tries to hitch a ride back. He lacks agency, being blown about on the winds of others’ actions. He is not an active participant in his own story for most of the series; He doesn’t do anything. Instead, things happen to him. A certifiable genius with a weak spot for beautiful women, his passivity makes him an unwitting accomplice to the apocalypse. He’s not a bad guy, but he’s excruciatingly human, a physical manifestation of a number of vices. He finds himself habitually in the wrong place at the wrong time, with a knack for finding the most self-serving outcome in every situation. In the end, he finds a bit of redemption as he joins the good fight in one single act of selflessness. And in the end, as he acknowledges his simple roots, with one line (“I know about farming”) I am satisfied by his arc. Is he redeemed? Ehh, probably not. But is Caprica Six? Is anyone, really? But that’s what makes the show special. Its humanity. I love the irony of that statement, and it speaks volumes of the show’s core. It has its own Wiki and will live on in the hearts and minds of BSG fans everywhere. Series finales are hard. You can’t please everyone. And, I would argue, the more outrageous and risk-taking a show is, the harder it becomes to wrap it all up in a way that is satisfying. (See Lost) From the small number of opinions on BSG I’ve glazed over, it seems like a lot of people were not happy with the finale. 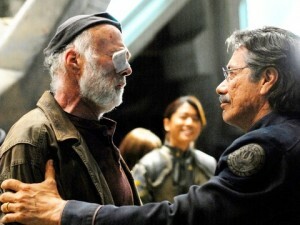 Well, I hated the Lost finale, but I loved the BSG finale. I’ll tell you why. Lost did some comprehensive universe building, and the finale had the characters end up in a church. The church had no significance. It could have been any church. It could have been a Red Lobster. I don’t need a finale to explain everything, but I do need the finale of a multi-season show to pay respect to all the things about the show that got it to where it ended up. The church was a cop out. BSG may have left some strings, but it satisfied a lot of the questions in its ambiguity. They found ‘Earth’ – doesn’t matter if it wasn’t the one they were looking for. The twist of it being modern-day Earth was a clever surprise. Sure, forgoing all advanced technology to settle among primitive man in Tanzania seems a little far fetched, but it is TV and we’ve been on board with rebellious humanoid machines up until this point, I think we can suspend our disbelief a little further. I hope Romo finds a new domestic cat. For me, Kara disappearing into thin air was satisfying. For a character who died in blaze of glory once already, for a character whose fear is to be forgotten, this quiet exit is actually the perfect resolution. Lee will remember her as he climbs Mount Kilimanjaro. There could really never be a perfect resolution to the Kara and Lee relationship. They would never work in reality; Kara needed to always be fighting for something (they were at their best fighting, whether it was together or each other), and now that they were on solid land with nothing left to fight for, she couldn’t have been content. Their relationship is one that is more beautiful unfulfilled. And her disappearing gives us that in a way that no other ending would have. And, if viewers weren’t satisfied by the abruptness of their resolution, Adama and Roslin made up for it with a soul-shattering ending that left me a limbless pile of emotions. I had in fact been dreading Roslin’s death since the pilot episode. When he took his wedding ring off and put it on her hand, sure I was a little worried about him not keeping his eye on the road, but I was also sobbing. I can only hope that he builds a cabin and grows a mustache in her honor. What’s so great about Starbuck and Apollo is they have not happened before, and they will not happen again. It makes complete sense that Starbuck was a male character in the original series. While I hate to stereotype and hate the phrase “conventional gender roles” even more, I will use it here, because it’s a simple way of explaining a complex relationship. The trick to a great TV pairing is to keep viewers engaged over multiple seasons, and regardless of genre, it is always the same: bring them together enough to make viewers want it, and pull them apart enough to make viewers want it even more. The recipe usually involves a healthy dose of emotional unavailability, a complicated past, a fear of intimacy, etc. In most TV shows, while I hate to say it, this is “conventionally” the guy’s role. What makes BSG so unique is that it totally flips the script on that stereotype — and does so intentionally, providing a not-so-subtle critique of the way we perceive gender. Kara was married to Lee’s brother and blames herself for his death; she has daddy issues, mommy issues, intimacy issues, harbinger of death issues. She loves Lee, but has other things going on that take priority, she’s married to her job (and another guy), has a crippling fear of commitment, etc. Lee puts up with it, makes all the appropriate excuses, he wants to talk about his feelings and literally shout it from the hilltops. And BSG is totally aware of what it’s doing, and I would argue, intentionally pokes fun at these conventions throughout the series. Lee’s emotional binge eating, c’mon. How many tubs of freeze dried Ben & Jerry’s do you think got him over Starbuck. But throughout the series, I rooted for them. In the end, I still rooted for them. But what makes BSG great is its realism (spaceships and centurions aside) – The scope of the show was bigger than them, the part they each play in the bigger picture was bigger than them. And it worked. So so well. For me, their standout episode was Season 3’s “Unfinished Business,” which provides a spot-on metaphor for their messy history through a boxing match, which leaves them bloody, beaten, tired, with nothing left to give. And yet that last shot is just so well done, because after everything, none of it matters, and for some masochistic reason even Doc. Cottle can’t diagnose, they still need each other. While it seems like such a small thing, in the scope of such an expansive show, the use of “All Along the Watchtower” has to be one of my favorite choices made by BSG. That simple decision (they could have used any song, any string of notes, anything, really) impacted the show, its direction, and its pop culture significance, offering an ominous, strangely familiar tone to the cylon reveal. Because along with Tigh, Tory, Tyrol and Sam, we slowly began to recognize the notes as well. And the last scene of “Crossroads,” with the shots of space and the vipers, ending with Lee and Kara and Earth, just worked so well from a purely aesthetic sense. The same is true as the song comes back into play in the series finale. As we hear the music coming from the radio on present-day Earth, there is this cyclical connection that happens intuitively between the past, present and future. 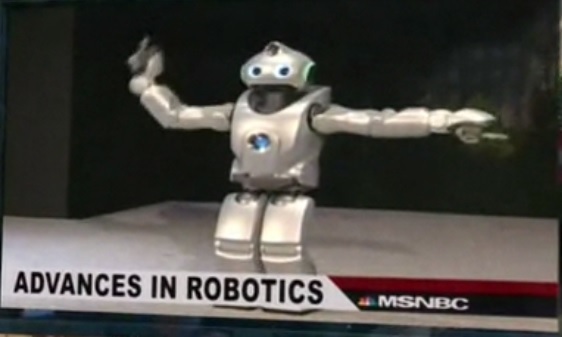 And the final scene (2:00 mark below) has to be one of my favorites of the entire series, with the rudimentary “futuristic” robots dancing to it. This has happened before, and it will happen again. A woman who receives a cancer diagnosis, but survives an apocalypse? A Secretary of Education who somehow becomes next in line for the Presidency? A rational woman who becomes the poster child of a religious prophecy? This woman has the odds stacked against her, but she rises to the challenge, becomes a political force to be reckoned with, leads a religious awakening, and finds love with BSG‘s most eligible mustache. So maybe they blew the budget on space and explosions and couldn’t afford a fat suit that didn’t make Lee look like a Klump. Still amazing. Building towards a reveal as big as the “Final Five” is a challenge. The reveal has to be satisfying to viewers that have been strung along for the ride and it has to have an element of surprise. Yet, if too randomly selected, it could feel like a cop out. 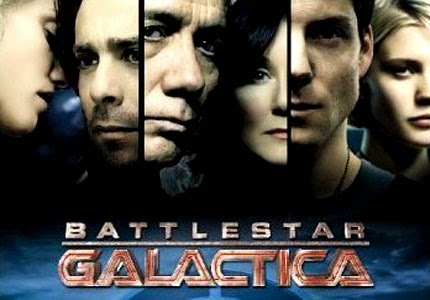 For me, BSG succeeded in its choices. 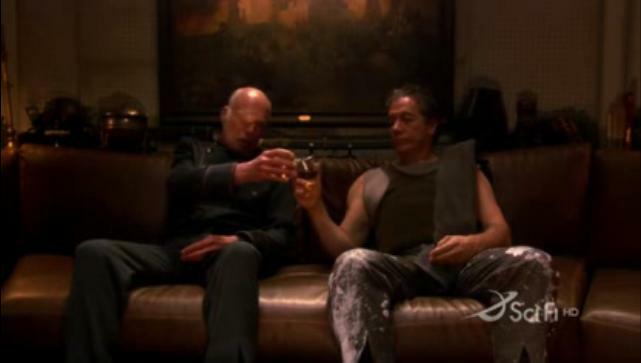 Tyrol, Tigh and Sam function in different capacities on Galactica, making their coming together from various parts of the ship feel like a unification – and they had shared the bonding experience of the insurgency on New Caprica, which gives them a sense of camaraderie they wouldn’t have had otherwise. The fact that the insurgency was against the cylons? Well, that’s just BSG at its best. And while the reveal of the four was extremely well done, the identity of the fifth was the one that left me mouth agape for minutes after the credits had finished rolling. In the final moments of “Sometimes a Great Notion” as Tigh experiences a flashback to his previous life on Earth and the apocalyptic event that killed him along with the others, he sees Ellen. $%&#, Ellen is the fifth! (Seeing her face on Caprica Six becomes a revelation, making it so much more than the delusion of a damaged man.) And, after seasons of speculation, after the suspense had been built and held (“Four are known. One Will Be Revealed”), the fact that they barely acknowledge this huge reveal in the following episode is pure genius. Luckily, I could just pop on the next episode with the click of a button, but for those who had to wait, this must have felt like emotional waterboarding. His name was Liam, it’s short for William. @!#$&*$ Are you frakking kidding me? I will never recover. To the best ship in the fleet. 5. “The Hand of God” (S1) — Great early episode that sets up Roslin’s character and the dichotomy of faith vs. logic perfectly. 3. “Daybreak” (S4) — Three Parts. All Amazing. An ending that did not disappoint. 1. “Crossroads” (S3) — Baltar’s trial, the reveal of the four cylons, Kara’s return. So much action, so many shocking reveals and some of the best TV writing of all time. This entry was posted in battlestar galactica, sci-fi / fantasy and tagged battlestar galactica, BSG, Caprica, Caprica Six, Colonel Tigh, Cylons, Edward James Olmos, James Callis, Jamie Bamber, Kara Thrace, Katee Sackhoff, Lee Adama, Mary McDonnell, Michael Hogan, President Laura Roslin, Saul Tigh, sci-fi, science fiction, Starbuck and Apollo, Syfy, Tricia Helfer by Amanda. Bookmark the permalink.